The joy of God fills our hearts today! Psalm 149:3 "Let them praise God's Name with festive dance; let them sing praise with timbrel and harp." We rejoice today as we ordain Kim Turcotte a priest with the Association of Roman Catholic Women Priests. closeness embracing her and all who are left out, ignored and treated as second class. Mary’s message is Jesus message of boundless compassion: God loves each of us and all of us. In the Heart of God we belong to each other. We are family, we are kin There are no “us” and “them”, no outsiders. All belong All are one. The Spirit of God moves through us every day as we reach out in kindness and in loving service to those in need, widening the circle. 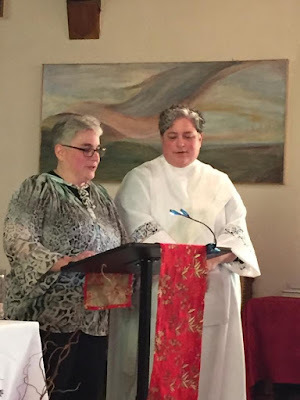 The Association of Roman Catholic Women Priests is living the Holy One’s all–embracing love by erasing the margins of exclusion that prohibit women priests. We are creating communities of compassion that welcome divorced and remarried Catholics, gays, lesbians, and transgender to the Banquet Table to celebrate sacraments with us. Standing in solidarity with those who suffer discrimination in our church and world, so that the discriminating will stop, we are erasing the margins now in our faith communities. The good news is that women priests in 35 states and 13 countries are fostering inclusive communities of kinship that are grounded in Jesus’ vision of an open table where all are welcome and all are loved as equal images of God. No one is second class. All belong in the circle in our compassionate, empowered communities. We are leading the church forward, not leaving the church we love. We are following Jesus who called women and men and treated them as disciples and equals. As you know, Jesus did not ordain anyone and there were more than 12 apostles. Mary of Magdala was called the apostle to the apostles because she was the first to encounter the Risen Christ and to share the Good News with Peter and the community. In Romans 16:7 Paul calls Junia an apostle, who with her husband Andronicus, were his mentors and inspiration. Scholars remind us that women served as deacons, priests and bishops for the first twelve hundred years of the church’s history. So, we have come full circle. Now as you have probably heard in the news, Pope Francis has named a Commission to study the question of women deacons. In May, two of our women priests in ARCWP, Janice Sevre Duszynska and Christina Moreira represented our movement in Rome . They met with a high level Vatican official who promised to deliver the petitions from our supporters to Pope Francis that requested the lifting of all punishments including excommunication. The next day, along with representatives from Women’s Ordination Worldwide, both ARCWP priests were escorted by Roman police to seats at the Papal Jubilee Mass. The women priests received communion. I believe this is a sign of hope and kinship. Stay tuned, the story is evolving, the dialogue has begun. As we ordain Kim, today, the Seed Community is making history by promoting justice and equality for women in the church. As a seed of God’s tenderness and love, you are a circle of compassion, pushing the margins of the church as you live kinship with all including divorced and remarried Catholics, gays, lesbians and transgender, and many more. Just like Jesus in the Gospels who ate with the poor, and outcaste, all are welcome in your vibrant community here too. With Mary, mother of Jesus, we proclaim our hymn of praise, our Magnificat. 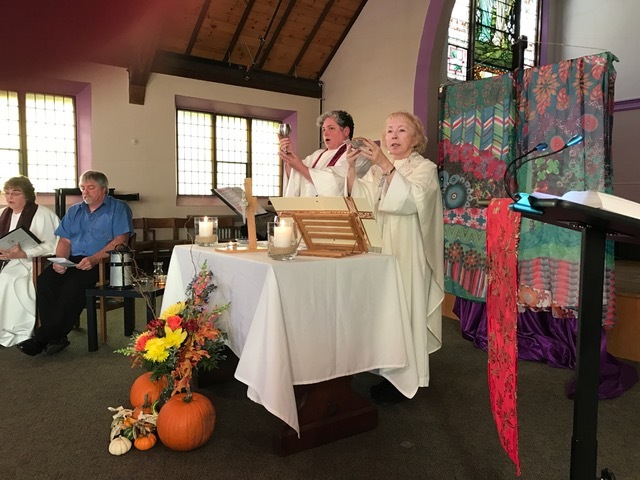 The Association of Roman Catholic Women Priests gives thanks that God's power is loving, healing and transforming through us as we erase the margins that exclude and embrace all in circles of compassion in our inclusive communities. Today we celebrate our blessed kinship, our oneness in Christ with the people of God in the church, as we ordain Kim Turcotte a Roman Catholic priest in Manchester, New Hampshire. So I volunteered to write the witness statement for my wife, the soon to be Reverend. So what do I say that is not too revealing? Nothing, as anyone who knows Kim will tell you, she is an open book. She just cannot fake it in anything. What you see is what she is. In a word I am in AWE of this person, to me she is a “prophet”. Her role, regardless of faith community has been to “call out” both to God and from God to his people. I have witnessed her transformation from a person struggling with faith in the supposed love of God and each other that Christian’s profess, to a person with a rock solid faith in and beautiful relationship with God and is faithful to the call to serve the church as a servant of Jesus Christ. All this in the short time of 14 years. It has not been an easy journey. Again and again she has encountered Christian action and words in community and outside of community that have not raised her up but have dragged her down and exiled her from relationship with other Christians. So she turned to other faiths. The other faiths she studied and practiced with observed the same tenets of personal relationship and worship of the divine being she believes are all the same - one being of God. Whether it be called Goddess and God, Mother Earth and all of creation, Enlightenment, Tao, Spirituality or Christ. The truth that she has discovered is that God calls people into relationship with himself through any means possible. We as humans will be drawn to various practices of ritual faith and not others and God tries to reach all of us through this diversity. 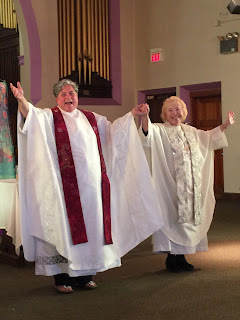 She herself was brought back to the Christian faith through the personal study of the bible and through the practice of daily catholic prayer and weekly mass within a very open and loving community. Kim is not a natural leader. She is not especially charismatic; she is not extroverted; she is not a confident speaker or teacher. She is however, a sincere lover and believer of the triune God, Son and Spirit as revealed in Scripture. She is passionate about sharing that with others who seek relationship with our creator, teacher and counselor. She has faithfully answered the call to serve by the grace of God through receiving the sacrament of Holy Orders and becoming a catholic woman priest. This woman, who had no formal education, no money to obtain an education, no confidence that she had the ability to be educated undertook an aggressive track to do just that. God provided a way, her Mom stepped forward and offered to help as much as possible with her school costs. Then, like everything else in life, she just dove in whole heartedly and is a true scholar in the study of theology, scripture and pastoral ministry. During this adventure she has discovered that she is a very gifted writer and she is also a gifted speaker. Skills she had not been gifted with before she answered the call to serve. Only when we discover our true, God created purpose, are all of our Spirit given gifts apparent. This has happened with Kim. Today she is a confident writer and speaker. A scholar of Scripture and Christian theology, a teacher and peer example as to how to apply these ancient words and modern thoughts and views to everyday life of the average person in the secular world. She is very skilled in being able to interpret the most challenging biblical passages into messages of truth and guidance in how to deal with our relationship with God and with our relationships with each other. To God, I thank you for putting this person in my life. My life has changed 180 degrees from where I was when we met and so has hers. We like to describe our marriage as an Oreo cookie. Kim and myself are the crunchy, stiff, crumbly outer cookies and God is the sweet sticky stuff in the middle that holds the whole thing together. Without God in the middle, we are just two plain cookies forever apart. With God in the middle we become whole. This is true for every relationship. So yes, MEGA STUFF is way better! God put us together to be able to strengthen each of us through the other so that he would put us in a position to strengthen all who we are involved with through the teachings of Christ and the fellowship of Christian community. 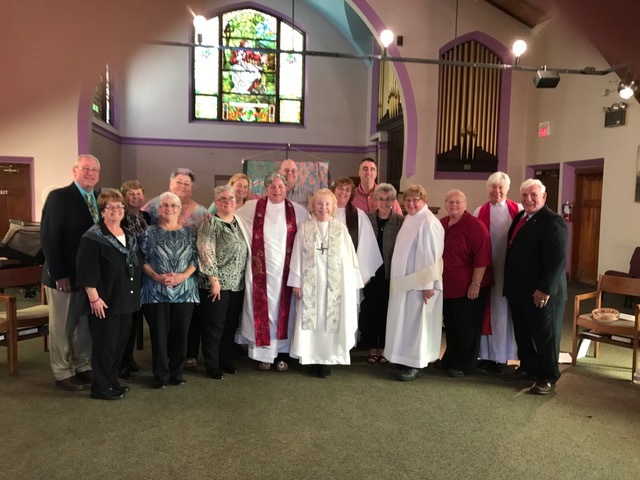 Having Kim become a servant of the church by receiving holy orders and becoming an ordained priest is only one more step in the journey that God has prepared for her and for us as a community.